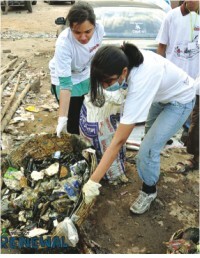 Volunteers wearing gloves, masks and gum boots, cleaning the surface litters by Road 29, Gulshan 1, opposite of Karail ghat. Participants packing the trash in bostas for disposal in the appropriate places. That's a wall post in the “Project Renewal” Facebook group that best descried the project's achievements till date. Who has not travelled the streets of Dhaka and at least once wanted to magically wish away the thriving piles of garbage? I am pretty sure that all of us have, until the stench wrinkled our nose and the hostility of it made us look away; the thought probably never lasted long enough to make an impression. But that is not always true. Project Renewal aims to leave that impression. Project Renewal is a student-based environ-mental concern aiming at community development while focusing, for now, mainly around the Karail settlement situated on the Gulshan-Banani Lake. House of Volunteers (HoV) at BRAC University (www.houseofvolunteers.org) has partnered with One Degree Initiative (www.1di.org) and the crew of Finding Bangladesh (www.findingbangladesh.com) to carry out this project in five phases. The over 150 participants of the project are students ranging from O' Level to University Level, including students from IBA, BUET, NSU, IUB, AIUB, East West and of course BRAC University. Project Renewal Lake Clean-up participants after a hard day of labour and clearing over 600 sacks of trash. The Gulshan-Banani Lake has become a melting pot of problems. While encroachment persists, the surrounding slum community has continuously bickered about unhealthy living standards and boatmen have often complained how incessant accumulation of solid garbage has made manoeuvring their boats difficult. In the first phase HoV, BRACU members conducted a survey to derive the demand for a cleaner environment amongst the lake-side and non-lake side dwellers, both in the Korail settlement and the apartments. The research findings are aimed to incentivise the government and other private organisations to actively step into the water body development scenario. The study will be published along with a policy brief and will be released during a seminar at the end of July. 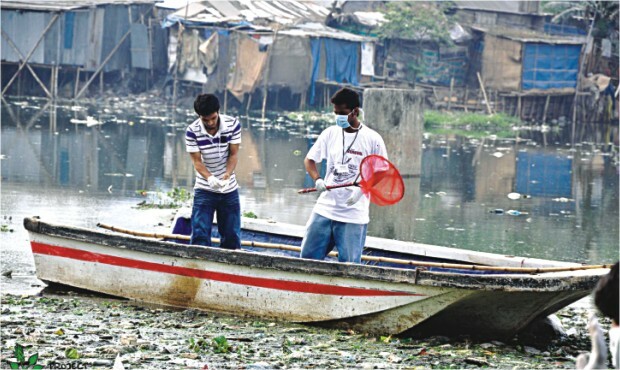 Using boats and netted rackets to clean the trash infested sludge in the lake by the TNT Colony, Road 1, Banani. The really amusing part to watch was the youngsters diving into the trash and collecting them for disposal. As Sadman Alam Sakib, a One Degree Initiative volunteer puts it, “I am literally not afraid of falling in drains now.” The other interesting part to note was the smooth working dynamics between the three organisations. As Gazi Nafi, a participant from Team Finding Bangladesh puts it, “Seriously, I did not really care about which organisation to support for this or how I was part of this. I came in to join this awesome project and make some difference, as small as it maybe. But the combination is remarkable; all these organisations prefer results rather than winning or making their own name be heard.” Such dynamics were brilliant, which would probably have been difficult to obtain if more mature organisations had taken up this task. Project Renewal Recycled Paper Making Workshop participants after successfully making 200 recycled paper from kochuripana (water hyacinth) and used paper. Group participants from the Project Renewal, Recycled Paper Making Workshop at BRAC University. The participants also picked out the water hyacinths, locally known as kochuripana (also breeding spots for vibrio cholarae), which was used to make recycled paper in the third phase of the project. While 200 recycled papers have been made in the first workshop, another workshop is scheduled to take place at BRAC University, open for all students, at the beginning of the summer semester. The fourth phase aims to make kochuripana recycling a social business among the women in the Karail settlement, thereby lending to the sustainability of the entire project. Finally the fifth and final phase will involve a seminar where the project will be highlighted and the research findings will be disseminated to appropriate universities and institutions. Project Renewal in no way is a one-time initiative to keep our lakes clean. In fact, it is a consistent call for private organisations and lake-surrounding communities to become more aware of the ecosystem of the water bodies, and implement sustainable solutions towards conserving it. 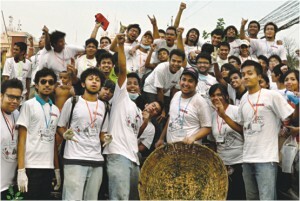 In the process, the project hopes to change the way the volunteers observe the world, and more importantly trash. Here's to hoping a whopping success in their endeavour and to all the mighty volunteers. Be brilliant!